Raymond and Joyce competed during the 1960’s as amateur competitors winning both area and county championships. They became professional competitors during 1969 and retired from competition during 1972 to concentrate on their dancing school; Callis Waudby for Dancing. A highlight of their professional competition period was dancing the Tango in the semi-final of the British Professional Championships in Blackpool. Callis Waudby for Dancing opened during October 1969; qualifying as teachers with the IDTA during 1970. Raymond and Joyce specialised in teaching adult and children beginners and entering pupils for medal tests. They went on to hold the biggest medal test in the world for the IDTA at that time, with nearly 700 medal tests entered. During 1972 Raymond and Joyce began Ladies Disco Rhythmical Fitness classes offerring Latin American dance and disco movements coupled with body exercise movements. This class is still delivered today. During the early to mid 1990’s they introduced American Country Line Dancing into the school; this led to them being contacted by a Professor Purdie Consultant for metabolic bone diseases at the Hull Royal Infirmary. Professor Purdie had discovered that a small number of his patients had increased their bone density thanks to the Callis Waudby Line Dancing classes. After time spent with Professor Purdie, Raymond and Joyce choreographed specific line dances and with the support of the local branch of the Osteoporosis Society they commenced line dance classes for people who sufferred from osteoporosis. Again they still have that type of class running today and have successfully raised many thousands of pounds for the local branch. 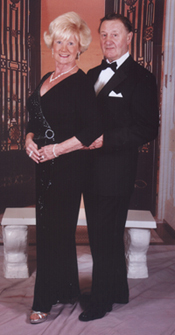 Raymond and Joyce have recently perfromed caberet and demonstration shows and still enjoy teaching beginners to dance. Callis Waudby for Dancing continues to teach beginners to dance at the Women’s Institute Hall in South Cave. Full details of classes offered can be found on the Dance Classes page of this site. Callis Waudby for Dancing classes are available to clients living in South Cave, North Cave, Hotham, Everthorpe, Drewton, South Newbald, North Newbald, South Cliffe, North Cliffe, High Hunsley, Low Hunsley, Riplingham, Little Weighton, Walkington, Bentley, Skidby, Eppleworth, Cottingham, Willerby, Kirk Ella, West Ella, Anlaby, Swanland, North Ferriby, Melton, Welton, Raywell, Rowley, Elloughton, Brantingham, Brough, Ellerker, Crabley, Gilberdyke, Newport, Howden, Scalby, Sandholme, Sancton, Beverley, Bishop Burton, Market Weighton and all other East Yorkshire villages.